For those of you who don't know me, I am new to Boston Handmade. 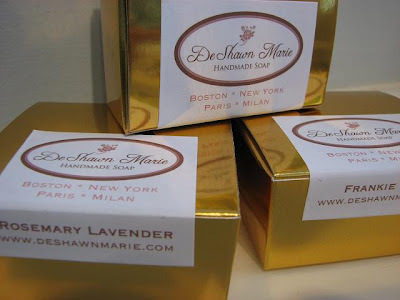 My name is DeShawn Marie and I've been making handmade soaps, candles and more for over 12 years now. I spent all day yesterday making, cutting and boxing soap. When I got up this morning and saw it was like this out my window. I thought oh well I guess it's another good day to work. 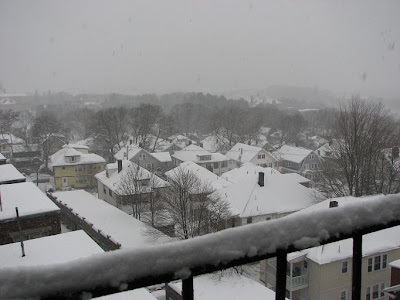 I'm starting to get a little used to this snowy weather even though this is my first winter in Boston. I recently moved here from NYC and have been pleasantly surprised at how welcoming and warm everyone here in Boston has been. MMm and that's not what I heard before I moved here :) So with that said I have to say what other town can you move to with a business and have it up and running strong within a few months. I don't think too many towns can boast of this. Then to top things off to be able to get involved with such an amazing group as Boston Handmade!! I gotta say this place ain't so bad. So I wanted to share a little bit of what I've been doing in this cold, snowy weather. The last few days our place looks more like a manufacturing plant than a cozy apartment in Brighton. 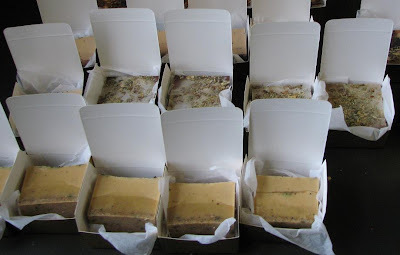 I make all of my soaps from scratch in small batches and put them in small loaf molds until they are ready to be released and cured. 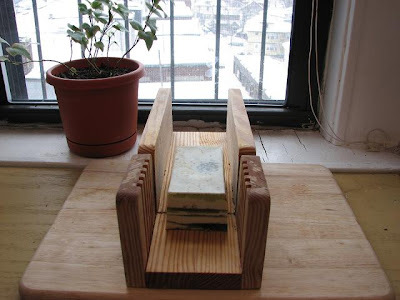 When they are ready to cut I put the small loaves on my soap cutter which looks like this. I then line the soap up with the lines on the soap cutter for the size that I would like the soap to be. Here is what that looks like. 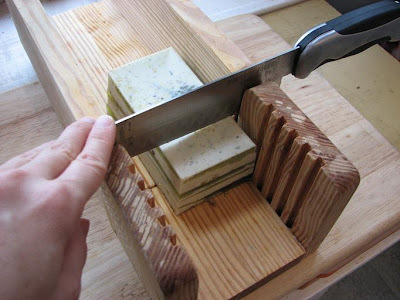 After that I cut the soap straight down with a blade as shown in the picture below. Then they are ready to be boxed and prepared for being adopted into some one's home :) Below is a picture of my assembly line of packaging. I then close them, label them and voila the perfect GIFT! As everyone says "they look like expensive European chocolates." So not a bad thing to be doing in this snowy, cold weather. Well atleast I enjoy it and I hope you all have enjoyed this brief peek into my soapy world. 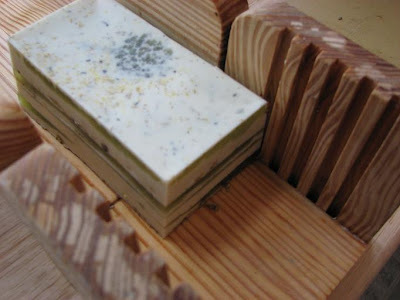 It's so great to see how your beautiful soaps are made! Your apartment must smell like heaven! :) thanks for reading. I thought this would be fun to show how I cut and package the soaps. I'll work on getting more in to it in the future.